The Passo delle Erbe is without any doubt the kind of road that once you ride it you will either LOVE it or HATE it! In my opinion, the Erbe is definitely one of the Dolomites’ Top 3 Passes . It’s like a cycling carousel because you can ride it to the top from all its sides (4 in total). You could spend all day riding up one side, descending the other, and riding it up again on another side. 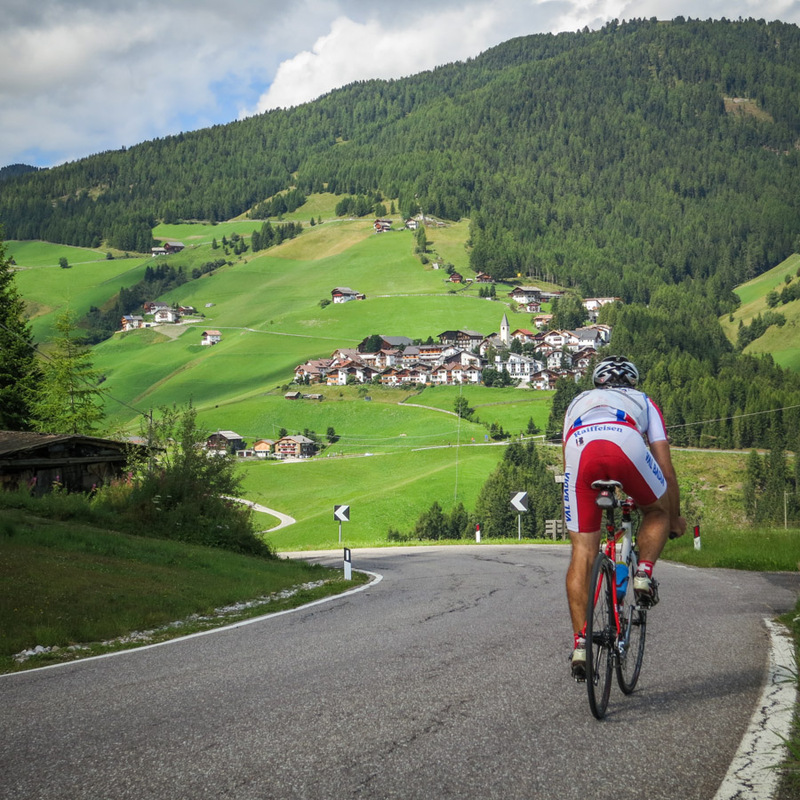 Here I’ll describe a ride that starts from the Val Badia Valley. 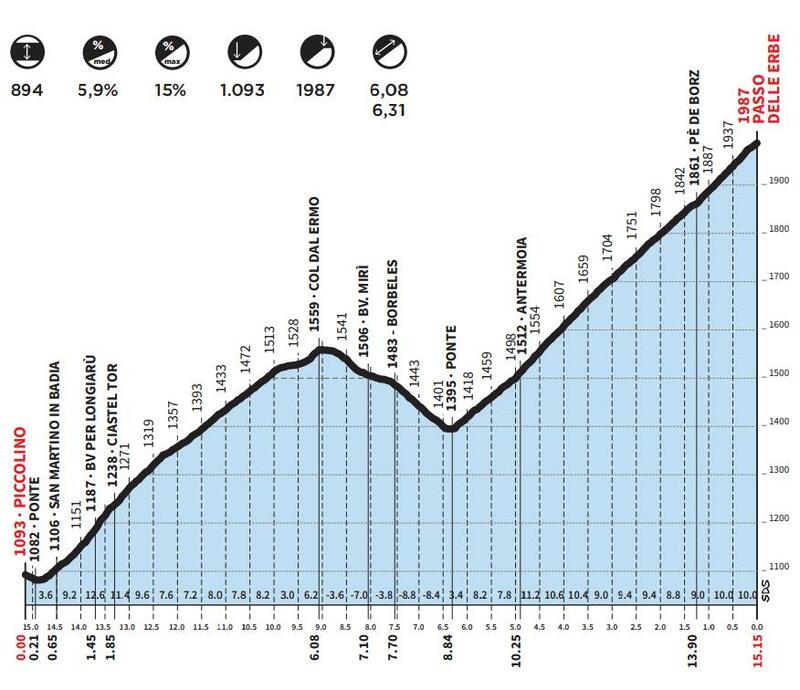 Without counting the short downhill portion, you have 12.50 km of climbing ahead of you and this is the ‘shortest’ climbing part of all roads that get to the top. This doesn’t mean it is the easiest, but it is among the hardest. When you climb the Erbe in the town of Piccolino you turn towards San Martino in Badia and …. wham! …. 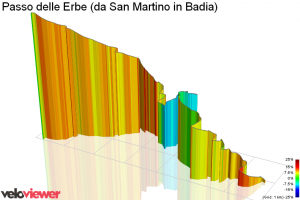 after you pass the town of San Martino you’ll hit the first wall – 11% to 12%, no problem. You hope things will ease up soon. Look above you and you’ll see the “Ciastel Tor”, a castle with a Museum that you shouldn’t miss visiting on a rainy day. To get to the castle you’ll need to use all your gears. 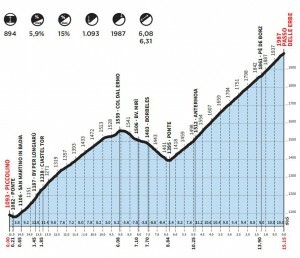 The hardest gradient of the entire climb is here: 15%. You will still see double-digit gradients on your GPS device until you reach the second hairpin after the castle. Finally there’s a change of tune starting with the 3rd hairpin. From now on after every hairpin the road flattens for a bit so you can get out of your saddle and push on your pedals in order to gain some speed hairpin after hairpin. The road is wide and not heavily trafficked, and it passes through a pine tree forest. After the steep part to the castle, you’ll enjoy this section. Once you reach Col dal Ermo (the top of this part) you have a 2.7 km descent ahead that will take you under the town of Antermoia. From this hill you’ll have a great view of what’s coming up next (see last picture of this post). Once the descent is finished, pedal stroke after pedal stroke, the road starts to climb again. You’ll reach the town of Antermoia. Once in town, a nice 14% ramp that passes near the church will welcome you in and, after you pass this, the road continues climbing above 10% and will stay like that for the next 1.5 km until you pass under a wooden bridge used for winter skiing. You’ll then come out of the forest and see the Pütia Mountain in front of you in all its splendor. At the feet of the mountain, on the right side, is the end of your ride for the day. But you’re going to have to suffer a bit more to get there! If you take time to look above you after the 2nd hairpin series, you’ll see the Pütia Mountain getting closer and closer, and soon you will find yourself at the top. Thank you Enda for your comment! Rode it today, the clouds and snow made it a heroic ride! Thanks for the info it’s a great site!! Leave a Reply to Enda Marron Click here to cancel reply.